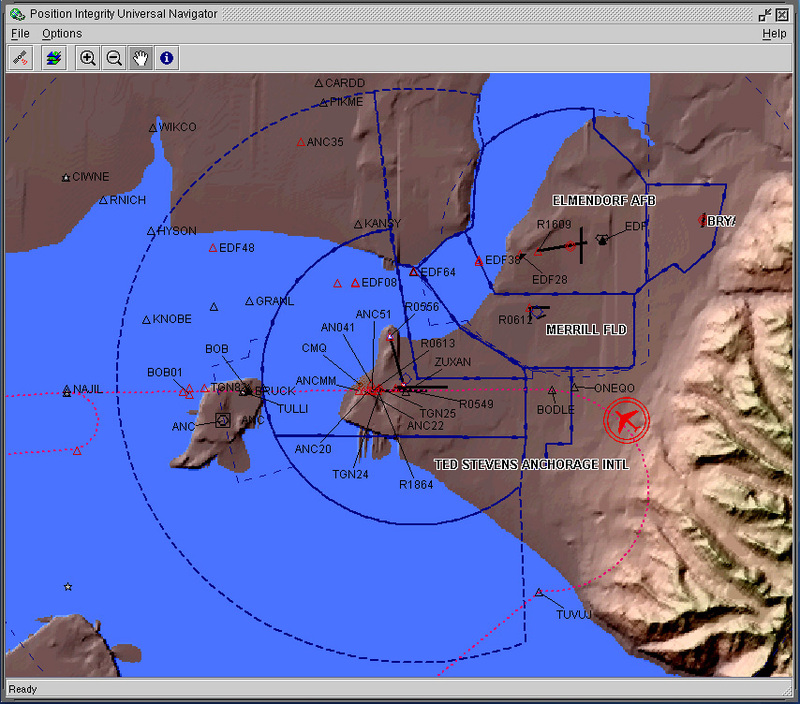 Universal Navigator represents the latest in situational awareness software application technology from Position Integrity. Initially developed under contract to NASA in support of advanced satellite-based wireless network research, the application provides a foundation and framework for platform-independent geographic visualization applications of virtually any kind. Beta releases of Universal Navigator commissioned by NASA provide for the transmission and display of real time data, including weather and air traffic as depicted in the screen shot below. Future Position Integrity initiatives will make use of this technology to offer subscription-based situational awareness services to the commercial and general aviation communities. Real time air traffic broadcasts, as one such initiative, will make use of existing wireless network infrustructures such as cellular and satellite phones to enable cost-effective alternatives to pilots where only extremely expensive integrated avionics solutions exist today. Universal Navigator is written entirely in the Java language, which means it will run in any operating environment where a Java runtime is available. It has been tested on Red Hat Linux, Sun Solaris, Apple Macintosh OS X, and the Microsoft Windows family of operating systems. 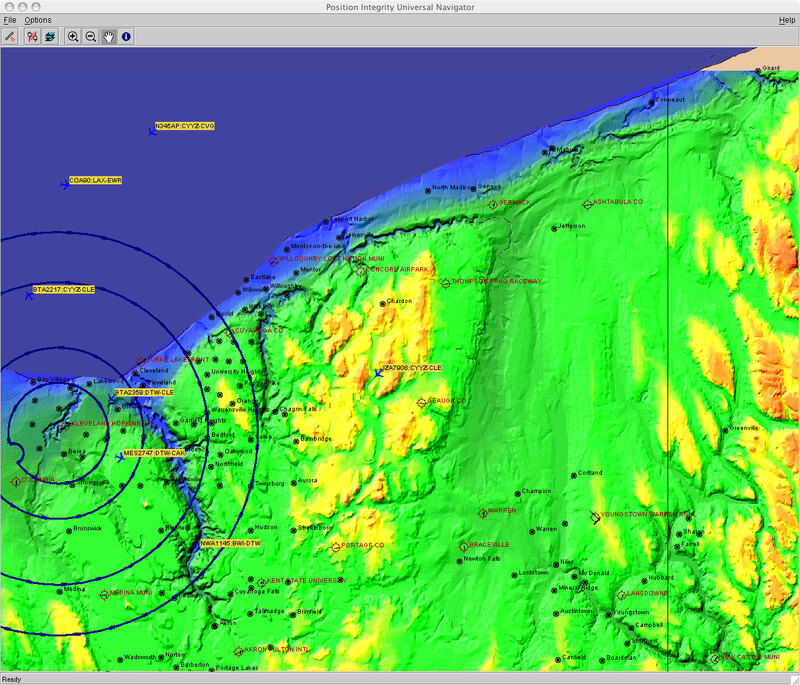 Utilizing various high-performance rendering algorthims, including the Java Advanced Imaging API, Universal Navigator is capable of displaying any vector, raster, or gridded datasets. 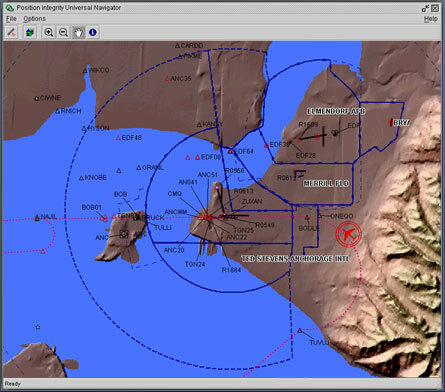 When applied in conjunction with customized datasets processed by Position Integrity, Universal Navigator provides the basis for powerful visual applications supporting real-time situational awareness on the land, sea, and in the skies. For more information about Universal Navigator and other software applications or related services, please contact us by telephone or email.